By throwing in as many activities as possible….in two days. We made a trip to the country for my friend and former co-workers 60th birthday party. Happy Birthday Ev! 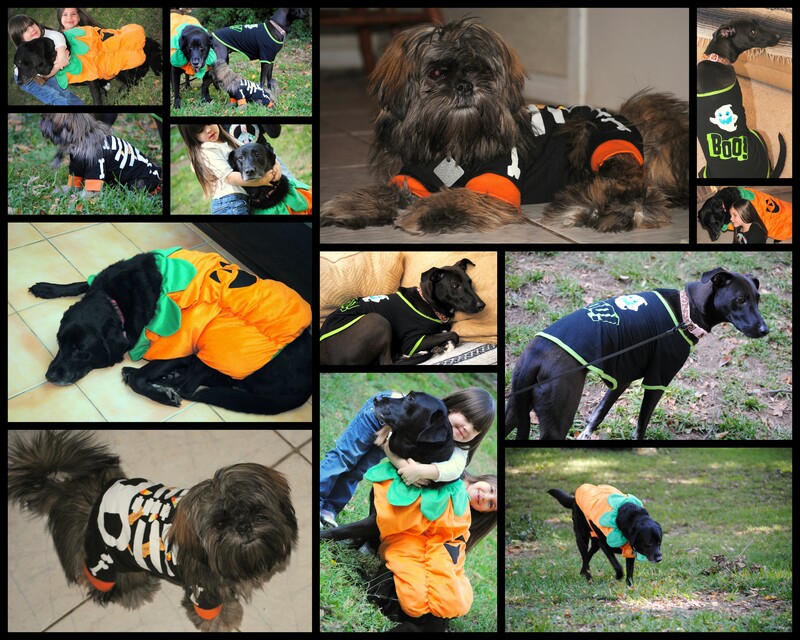 We made the dogs dress up. Salem, the black lab, a great pumpkin. Brownie, the Japanese princess shih-tzu, a skeleton. And Anna, the creeper dog, completely freaked out by a t-shirt on her back that says Boo. It’s quite ironic and hilarious. Then we made cookies. You know….just in case the trick or treat candy wasn’t sugar overload enough. Mixing food coloring gel to make orange icing. Plus two other kinds of cookies made straight from the package. Yeah, I skipped the from scratch part. Oops. We also made a trip to the pumpkin patch. I got some really great pictures. Magical, as in Supergirl in the corn field, and a ladybug in the corn maze. So cute! Then, I made these photo collages. The Mac, with my PSE on it, is in the shop. 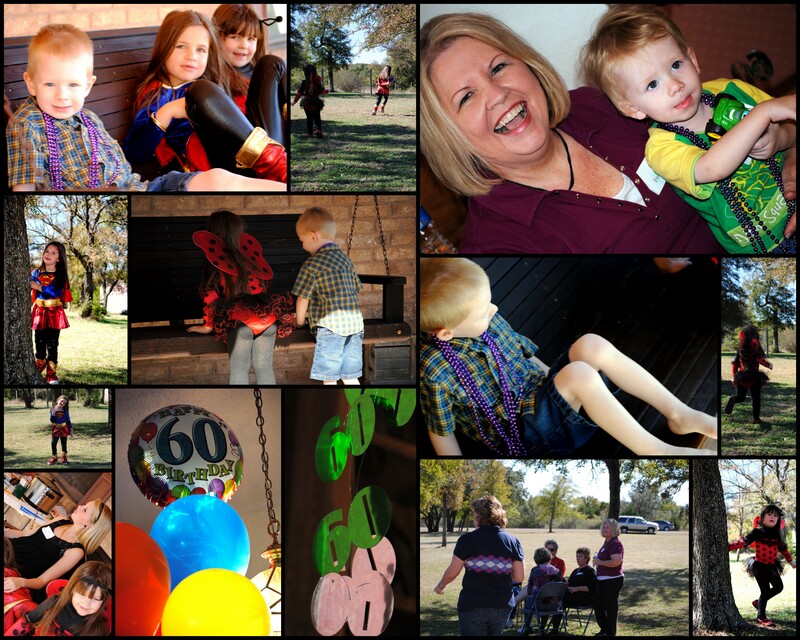 I learned something crafty by discovering the world of collages are a button away on Picasa. Why didn’t someone tell me? I triple heart photo collages. SITS girls asked us to link up our crafty posts. Well, this is mine and I say it counts. I made a lot of stuff happen this weekend and I’m feeling pretty crafty about that. I will have another post with our actual trick or treating last night. I shadowed the girl’s mom taking pictures of the girls getting ready and trick-or-treating in their neighborhood. It was adorable. Sydney dressed up too (at 16!). She got quite a load of candy. And Jason even posed for pictures with some of Bridget’s costume. What a weekend. Happy sugar hangover day! Great collages! I, too, have a Mac and use photoshop for collages ( in many steps) and did not know about Picasa. I will have to check that out. I’m visiting from SITS. Jennifer – Picasa is soooo easy. I tend to use it more than Photoshop. Although, I must admit that I don’t know how to work my PSE! LOL! Lovely photos and I am so glad you had a wonderful Halloween weekend. I shall have to learn how to do collages. These are gorgeous, Angelia! Very appealing; very captivating–you ARE crafty! You go, girl! Those pics are priceless memories. This is truly one of my favorite times of the year and favorite holiday! My kids are grown and live in another state, so naturally I did all the activities I used to do with my kids, with my boyfriend. lol…hope he didn’t mind being a kid for a weekend! Can’t wait to see your trick-or-treat photos! Sherri- Never grow old! It’s great that you keep up with the fun stuff. 🙂 I bet he loved it. Your collages look great! I just discovered (last week) that Photobucket also makes collages. Tanya- Glad to share with you! It’s just a button on Picasa 3 that will create and let you edit and design. Very cool and easy. If you need any help let me know. The collages are wonderful. We made cookies right from the package too. They came out much better than my from scratch cookies would have. Looks like a fabulous Halloweeny weekend! 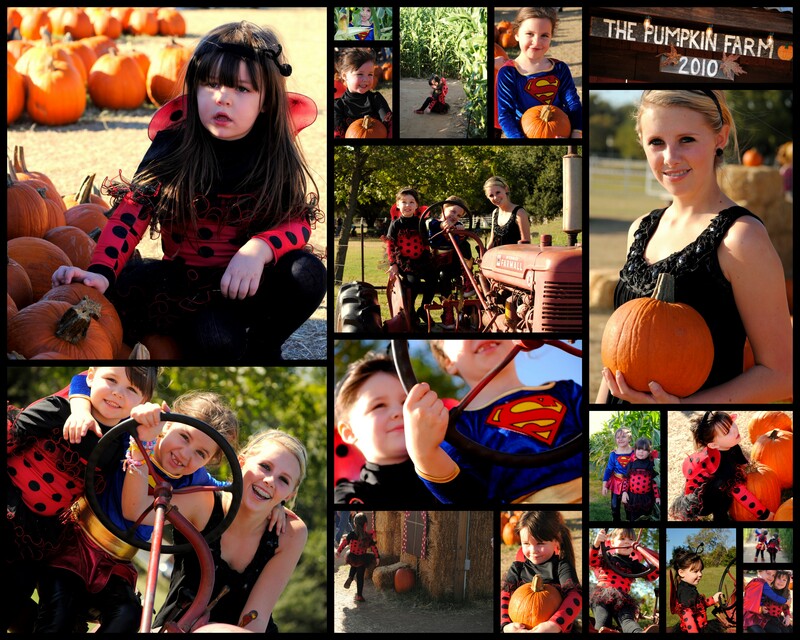 Suzicate – We are full up of Halloweeny til next year! I freaking love your collages! You are so talented. Also love the comment about someone eating their hat. Ev is one gorge lady! She reminds me of my lovely friend Donna! 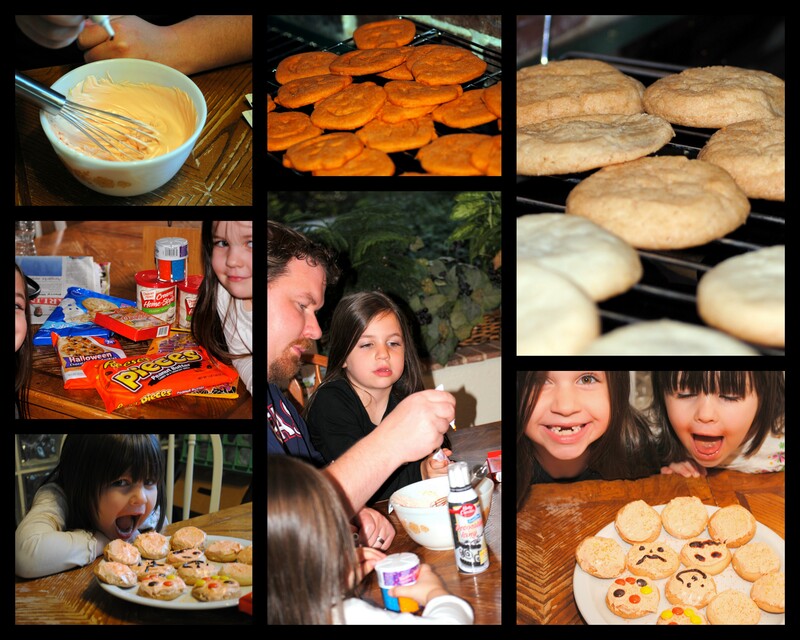 That’s what was missing from my Halloween this year: cookies! We’ve had this new computer for a couple of months now, and I still haven’t found the photo editing software it’s supposed to have — so, Picasa is my new BFF! May I please have one of those cookies? Homemade ones are always soooo much better. Since we don’t give out candy, and do Mardi Gras beads, there were no leftovers to give me the sugar headache. I’m a little behind on reading posts and I am reading them out of order. I saw your next post before this one. I LOVE the collages too! I was wondering how you did that. Now I know. Thanks!!!!!! They are awesome . . . . . of course, because they are awesome pictures taken by an awesome photographer, of awesome kids/people/places/dogs! Whew! I will have to check out Picasa again. I haven’t really used them to their full potential, and those collages really do look like fun. You always do a wonderful, beautiful job with pictures. I, however, must be the one to fuss at the cookies, icing, and candy in a house with a diabetic straight out of the hospital. Please, don’t tempt him too much!